Diagnostic views of Haplozetes similis, from Gil & Subías (1993) as 'Lauritzenia (Incabates) sinuatus'. The oribatid mite genus Incabates was first established by Marie Hammer in 1961 for a species from Peru (not surprisingly, with that name). Since then, species have been assigned to Incabates from tropical and subtropical regions almost throughout the world (though not, as yet, from the Ethiopian bioregion—Subías 2004). Incabates belongs to the Haplozetidae, an oribatid family distinguished by their possession of well-developed pteromorphs that are often, though not always, mobile, and jointed chelate-dentate chelicerae (Norton & Behan-Pelletier 2009; the nature of oribatid 'pteromorphs' has been explained in an earlier post). Incabates has been distinguished from other haplozetid genera by having a series of dorsal glandular openings on the body developed as tubular saccules, ten pairs of setae on the notogaster (the dorsum of the main body), four pairs of setae around the genital opening, and three claws at the end of each leg (Gil & Subías 1993; Weigmann & Monson 2004). The presence of three claws rather than one claw on each leg appears to be correlated with an arboreal lifestyle in oribatids (Karasawa & Hijii 2008), and Incabates species do appear to be mostly associated with forest habitats. There is a lot of taxonomic instability within (and indeed, around) the Haplozetidae, and it remains uncertain at this point whether Incabates should be recognised as a distinct taxon. Genera of Haplozetidae have often been distinguished by combinations of characters, often simply numerical (such as numbers of setae) and it may be debatable to what extent these characters reflect actual relationships. The checklist of the world oribatid fauna by Subías (2004) lists Incabates as a subgenus of Lauritzenia. 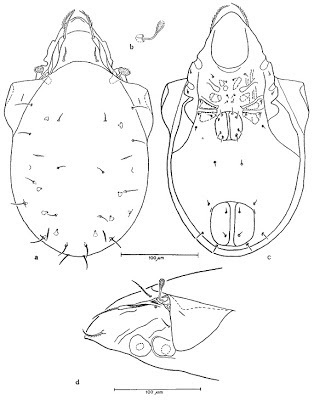 Gil & Subías (1993) separated Lauritzenia (including Incabates) from the related genus Haplozetes by the number of genital setae (four pairs in Lauritzenia vs five in Haplozetes) and then divided each of these genera into subgenera on the basis of claw number (tridactyl Incabates vs monodactyl Lauritzenia subgenus Lauritzenia). However, Weigmann (2010) argued that these characters might be too plastic to warrant generic distinction, and supported treating all as a single undivided genus Haplozetes until the relationships within the group were better established. As yet, that's something we're still waiting on. Gil, J., & L. S. Subías. 1993. La familia Haplozetidae Grandjean, 1936 (Acari, Oribatida) en la Península Ibérica. Mediterránea Ser. Biol. 14: 23-30. Karasawa, S., & N. Hijii. 2008. Vertical stratification of oribatid (Acari: Oribatida) communities in relation to their morphological and life-history traits and tree structures in a subtropical forest in Japan. Ecological Research 23 (1): 57-69. Norton, R. A., & V. M. Behan-Pelletier. 2009. Suborder Oribatida. In: Krantz, G. W., & D. E. Walter (eds) A Manual of Acarology, 3rd ed., pp. 430-564. Texas Tech University Press. Subías, L. S. 2004. Listado sistemático, sinonímico y biogeográfico de los ácaros oribátidos (Acariformes, Oribatida) del mundo (1758-2002). Graellsia 60 (número extraordinario): 3-305. Weigmann, G. 2010. Oribatid mites (Acari: Oribatida) from the coastal region of Portugal. IV. The genera Coronoquadroppia, Scheloribates, Haplozetes and Pilobates. Soil Organisms 82 (3): 383-406. Weigmann, G., & F. D. Monson. 2004. 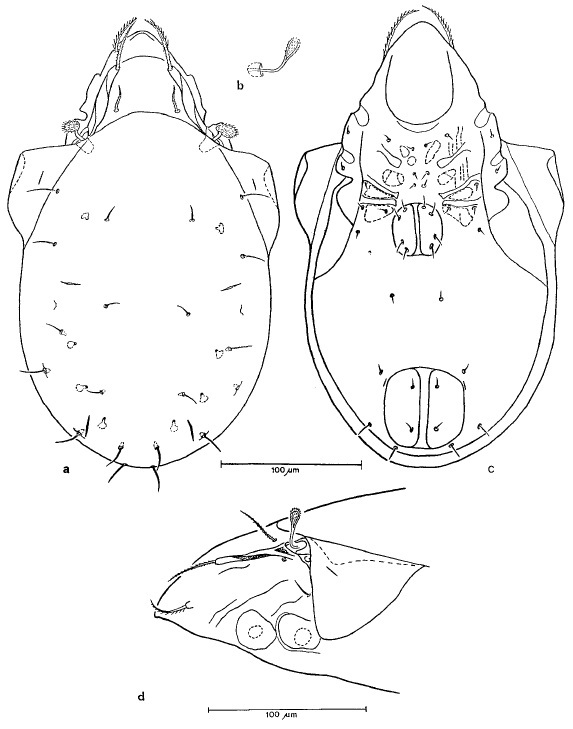 A new genus and species of Haplozetidae (Arachnida: Acari) from Great Britain with a key to the European genera. Journal of Natural History 38 (11): 1415-1420.